Pakistan’s government has a formal meeting with a Taliban-nominated team in Islamabad, officials say. The talks are aimed at charting a “roadmap” for negotiations that will try to end a decade-long insurgency. The government set out five conditions, including ending hostilities, saying a “journey for peace” had started. 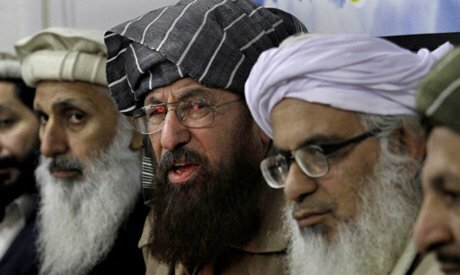 The Taliban team agreed to travel to the north-west to discuss the conditions with the leadership. Militants from the Tehreek-e-Taliban Pakistan (TTP) have been waging an insurgency inside Pakistan since 2007. The talks initiative was announced last week by PM Nawaz Sharif, following a spate of attacks. More than 100 people, including soldiers, died in Taliban attacks across the country in January. Thousands have been killed since the TTP came to the fore in 2007. The first session lasted about three hours at Khyber Pakhtunkhwa House in Islamabad. The head of the Taliban team, Maulana Sami ul-Haq, read out a joint statement afterwards. The Taliban team agreed to travel to Miranshah in the north-west to take the conditions to the leadership and pledged to report back to the government committee as soon as possible. Both committees agreed that neither side should initiate an act that might damage the talks process. The statement also said that the Taliban side had sought clarification on the power and mandate of the government committee involved in the talks, and whether it could accept and act on demands made by the Taliban. Both sides condemned recent violence. The Taliban want to see Sharia (Islamic law) imposed throughout Pakistan and US troops to withdraw from the region. Since taking office last May, Nawaz Sharif has come under mounting pressure to bring the violence under control, with many accusing his government of lacking a strategy to deal with the militants, correspondents say.